Ambitious and adventuresome in our choice of research subjects, this group is interested in fundamental understanding about issues of potential practical importance. 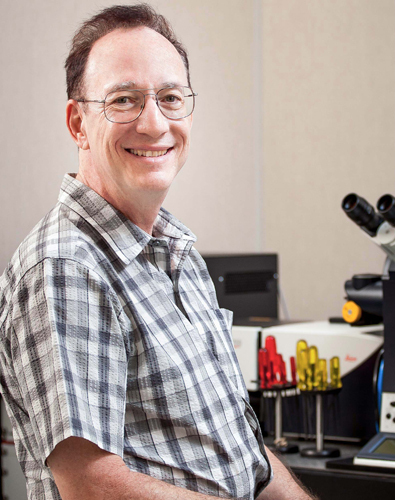 Steve Granick is Director of the IBS Center for Soft and Living Matter. This research team is interested in the chemistry, physics, biology, and materials science of everyday life. Our work focuses on soft matter, working across disciplines to explore imaging, assembly, behavior and interactions of molecules in living cells, and in specially designed colloidal particles and polymers. This research has broad applications in medicine, biology, chemistry, and manufacturing. 스티브 그래닉은 기초과학연구원 첨단 연성 물질 연구단의 단장직을 겸하고 있는 유니스트 석좌 교수님입니다. 이 연구 팀은 우리가 매일 접하는 일상 생활과 밀접하게 관련된 화학, 물리, 생물 및 재료 과학 분야에 많은 관심이 있습니다. 현재 집중하고 있는 주제는 여러 분야에 관련되어 있는 연성 물질 분야로, 살아있는 세포 또는 특별히 디자인된 콜로이드 입자들, 고분자를 영상 분석하고, 이들에 있는 존재하는 현상 (결합, 행동 패턴) 과 분자들의 반응들을 탐구하고 있습니다. 이러한 연구 주제는 의학, 생물, 화학 및 제조에 이를 수 있는 넓은 분야에 적용이 가능합니다. "Enzyme leaps fuel antichemotaxis," Ah-Young Jee, Sandipan Dutta, Yoon-Kyoung Cho, Tsvi Tlusty, and Steve Granick, Proc. Natl. Acad. Sci. USA 115, 1 (2018). “Memoryless self-reinforcing directionality in endosomal active transport of living cells,” Kejia Chen, Bo Wang, and Steve Granick, Nature Materials 14, 589 (2015). "Colloidal-Sized MOFS (Metal-Organic Frameworks): Synthesis and Applications," Melinda Sindoro, Nobuhiro Yanai, Ah-Young Jee, Steve Granick, Accounts of Chemical Research 47, 459 (2014). “Linking Synchronization to Self-Assembly Using Magnetic Janus Spheres,” Jing Yan, Moses Bloom, Sung Chul Bae, Erik Luijten and Steve Granick, Nature 491, 578 (2012). “Directed Self-Assembly of a Colloidal Kagome Lattice,” Qian Chen, Sung Chul Bae, and Steve Granick, Nature 469, 381 (2011).